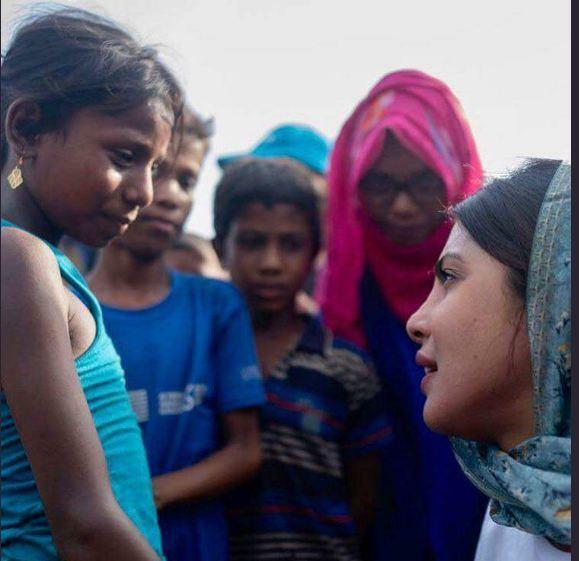 Unicef Goodwill Ambassador for Child Rights Priyanka Chopra visits Rohingya refugee camps on Tuesday. She shared a lot of video and photos on social media and captioned them as "I’m in Cox’s Bazaar, Bangladesh today for a field visit UNICEF, visiting one of the largest refugee camps in the world..."
In an emotional post, she wrote, "In the second half of 2017, the world saw horrific images of ethnic cleansing from the Rakhine State of Myanmar(Burma). This violence drove nearly 700,000 Rohingya across the border into Bangladesh - 60% are children! Many months later they are still highly vulnerable, living in overcrowded camps with no idea when or where they will ever belong...even worse, when they will get their next meal. AND...as they finally start to settle and feel a sense of safety, monsoon season looms...threatening to destroy all that they’ve built so far. This is an entire generation of children that have no future in sight. Through their smiles I could see the vacancy in their eyes. These children are at the forefront of this humanitarian crisis, and they desperately need our help. The world needs to care. We need to care. These kids are our future. " The Bollywood Diva has worked with UNICEF for over a decade as the global Unicef goodwill ambassador for Child Rights. Over the years she has worked for causes related to environment, health and education and women's rights.